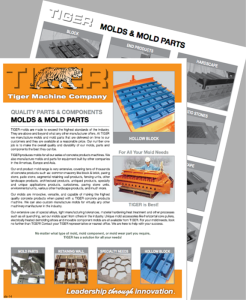 TIGER molds are made to exceed the highest standards of the industry. They are above and beyond what any other manufacturer offers. At TIGER we manufacture molds and mold parts that are delivered on time to our customers and they are available at a reasonable price. Our number one job is to make the overall quality and durability of our molds, parts and components the best they can be. TIGER produces molds for all our series of concrete products machines. We also manufacture molds and parts for equipment built by other companies in the Americas, Europe and Asia. Our end product mold range is very extensive, covering tens of thousands of concrete products such as: common masonry like block & brick, paving stone, patio stone, segmental retaining wall products, fencing units, other landscape products, architectural products, antiqued products, specialty and unique applications products, curbstones, paving stone units, environmental units, various other hardscape products, and much more. Our molds are innovative, versatile, and capable of making the highest quality concrete products when paired with a TIGER concrete products machine. We can also custom manufacture molds for virtually any other machinery manufacturer in the industry. Our extensive use of special alloys, tight manufacturing tolerances, material hardening heat treatment and other processes such as oil quenching, set our molds apart from others in the industry. Unique mold accessories like horizontal core pullers, electrically heated demolding shoes and movable component molds are all available from us. For your mold needs, look no further than to our company! Contact your TIGER representative or nearest office. We are here to help with your success. Please call us with your needs for personalized service for quality molds and mold parts!